“Next to Harry Truman, Stuart Symington was the man from Missouri,” says the author, president emeritus of the University of Missouri, in this scholarly yet accessible biography of one of the Senate’s most respected members. During his four terms from 1953 to 1976, Symington led the fight for a strong, independent Air Force and for increased funding for agriculture—Missouri’s leading industry. Olson is at his best when he describes Symington’s role in promoting the importance of air power as the prime deterrent against Communist expansion during the cold war. Harry Truman appointed Symington the first Secretary of the Air Force, where he proved himself an able administrator, enforcing the racial integration of the armed services and overseeing the Berlin Airlift. The airlift, Truman’s forceful response to the Soviet’s cutting off ground delivery of provisions and supplies to a war-devastated Berlin in 1948, convinced Symington that the Air Force, rather than the Navy or Army, offered the best counter to Soviet movements. Although he was one of the Senate’s prominent hawks during the Kennedy administration, Symington emerged as a dove in 1968, as he recognized that the Vietnam War was not going to be won by a corrupt South Vietnam government and that thousands of American troops were being sacrificed to this futile cause. Symington, a liberal on domestic issues, remained popular throughout his Senate career because he placed a high priority on the economic needs of Missouri. 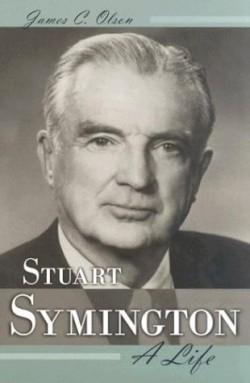 When he died at age eighty-seven in 1988, Stuart Symington received numerous tributes from Republican and Democratic senators, presidents, international leaders, and the people from his home state for his distinguished public service. Olson does not devote much attention to Symington’s personal life, but has written the authoritative political biography of one of Missouri’s most important politicians, illuminating the Senator’s many important international and national contributions.